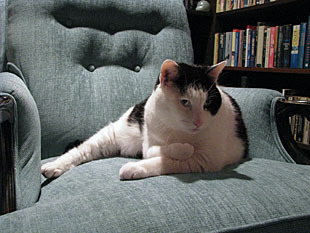 On the left, Inkblot has claimed ownership of the newly reupholstered reading chair. Surprisingly, it took him a couple of days. Usually it takes more like a couple of minutes when something new comes through the door. In any case, it’s his now. 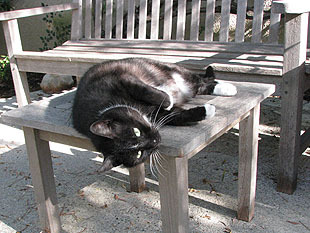 On the right, Domino takes advantage of our current November warm spell to enjoy the outdoor sunshine while she can. This turns out to be about 3.5 times per second for your average housecat, somewhat less for your kings of the jungle. So be sure to take a closer look the next time your cat ambles on by to the water dish. It’s all in the name of science.